One of the most popular walking paths in town is the Gatlinburg Trail, which runs from the southern end of River Road to the Sugarlands Visitor Center in Great Smoky Mountains National Park. Many visitors to Gatlinburg enjoy this trail as it is just one of two trails within the National Park that allow bicycles and pets. The Gatlinburg Trail is relatively flat and runs through the forest along the West Prong of the Little Pigeon River, which is eventually crossed by a pedestrian foot bridge. While exploring the trail, you have the opportunity to view the foundations and chimneys of several old homesites. If you stay in one of our pet friendly cabins in Gatlinburg, bring your furry friend along for a stroll! The City of Gatlinburg owns and operates several City Parks with scenic hiking trails, including Herbert Holt Park. This lovely park is located just off the Gatlinburg Parkway on North Park Lane and has many recreational facilities for visitors in addition to the walking trails. After taking a stroll, enjoy an outdoor lunch on the picnic tables and let your children run off some energy on the playground equipment. Herbert Holt Park also contains horseshoe pits, a children’s fishing stream and grills for public use. While many folks tend to stay along the Gatlinburg Parkway to window shop and dine, you can enjoy a more serene walk just a block away on River Road! This road runs from Ripley’s Aquarium of the Smokies on the northern end and travels just a short distance past the intersection with Ski Mountain Road. There is a sidewalk along the entire route where you can enjoy wonderful views of the river and the surrounding mountains. River Road is also a great place to get a unique perspective of the Ober Gatlinburg Aerial Tramway as it passes above you! Stay just minutes from these walking trails in Gatlinburg with a vacation at Auntie Belham’s Cabin Rentals! 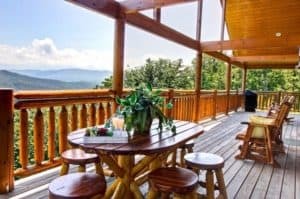 Our affordable cabins offer the perfect accommodations where you can relax after a long walk and enjoy the peaceful serenity of the Smokies. Whether you need a 1 bedroom cabin for a romantic getaway or a 9 bedroom cabin for a large group, we have you covered! While staying in our cabins, enjoy all types of fabulous amenities including fully equipped kitchens that come in handy for preparing meals throughout your vacation! Our cabins also feature soothing hot tubs, fireplaces, private decks, game rooms and much more! Check out all of our cabins in Gatlinburg TN today to plan your vacation near these pleasant walking trails in Gatlinburg. We look forward to seeing you soon at Auntie Belham’s Cabin Rentals!